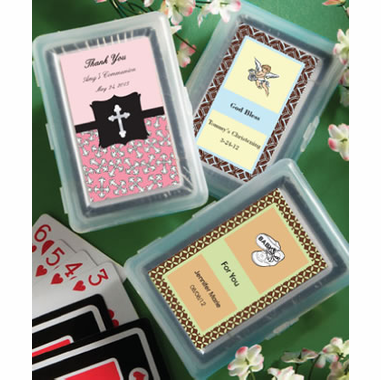 Your guests will enjoy using their playing cards long after your baptism or christening celebration is over. Your guest will love these unique baptism favors. 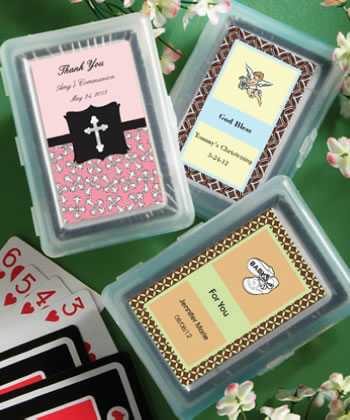 Each will receive a full deck of cards with a standard suits design on the cards and a personalized label for you to affix to the hard molded plastic case which opens like a book. Your personalized labels are not applied to the card cases prior to shipping - assembly is required for the personalized labels to be affixed to the box. Please be aware that the label itself is personalized, the cards themselves are not. Cards measure 2 ½"x 3 ¾"x ¾". These favors will not end up collecting dust in a drawer, but regularly used. Sold bulk packaged in individual poly bags.